1.It is my pleasure to join you for the inaugural session of this Mid-Term Meet of National Interventional Council. I am happy to have the opportunity to address this congregation of eminent cardiologists gathered here on the occasion. 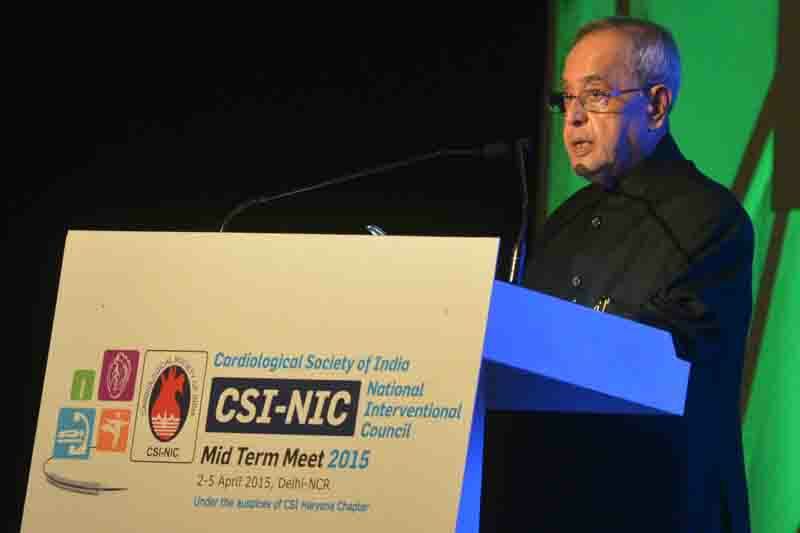 The Council, which is the interventional arm of the Cardiological Society of India, represents more than 2,000 interventional cardiologists of the country. I compliment you all for your achievements and for rendering yeomen’s service to the nation. 2.Interventional cardiology is a branch of cardiology dealing with catheter-based treatment of heart diseases. A large number of procedures on the heart are performed by catheterization. It involves the insertion of a sheath into the artery and cannulating the heart under X-ray visualization. This line of treatment provides key advantages to patients such as accessibility of the artery, easy control of bleeding, absence of scars and pain, and quicker post-operative recovery. Interventional cardiology represents frontline medical technology for the treatment of challenging ailments. 3.Healthcare is a priority area for technological pursuits. Discovery of better formulations, finding of more efficient medical procedures, production of sophisticated medical equipments, and development of nutritional and disease surveillance mechanisms underline the need for greater usage of technology. It is technology-based solutions that can up-grade our healthcare standards substantially. 4.Health research deserves greater attention of doctors, medical scientists, healthcare providers, educational institutions and policymakers.Development of sound systems of medicine and medical procedures requires translation of knowledge gained in other disciplines. Medical research has to be a culmination of multi-disciplinary effort comprising varied fields like medical electronics, systems biology, bio-technology, genomics, mathematical simulation, and information and communication. A holistic approach to improvise medical interventions would lead to better cure towards maintenance of good health by the people. 5.A healthcare system, which is universally accessible, affordable and effective, is crucial for a developing country like ours. To build such a system, we require robust healthcare infrastructure, trained and motivated personnel, and better access to medicines and equipments. There are 7 hospital beds per 10,000 population in India, compared to 23 in Brazil, 38 in China and 97 in Russia. In terms of healthcare professionals, we again lag behind the other BRIC countries. There are 7 physicians per 10,000 population in India, compared to 19 in Brazil, 15 in China and 43 in Russia. Though schemes like the National Health Mission have improved service delivery, health services in India still suffer from lack of reach and constraints of quality. 6.India’s public expenditure on health is meagre. We fare below our BRIC peers on this count as well. India’s per capita government expenditure on health in PPP terms is US Dollar 44, as against 809 in Russia, 474 in Brazil and 236 in China. Considering that we are a sixth of humanity, a significant rise in health expenditure is urgently required to ensure universal health coverage. 7.‘Health for All’ is a dictum that has to be implemented through a practical framework. Developed nations possess sound healthcare systems to take care of the medical needs of their populations. While we can study these systems for adoption, we on account of our size, population and diversity have to follow a model that best suit our needs. 8.Tertiary medical care in our country poses a challenge on account of lack of accessibility and affordability. Costly medical treatments effectively deny cure to those who cannot afford. In India, out-of-pocket expenditure comprises 86 percent of private expenditure on health. Due to lack of financial risk protection, many in our country plunge into poverty fighting ailments and bearing high costs of treatment. 9.A health insurance mechanism that can take care of all is the need of the hour. As per estimates, about 216 million people in India or 17 percent of the population were covered under various health insurance schemes as at end-March 2014. We need to do much more to bring the uncovered population under the health security net. An insured population will also be a healthy population, which will exhibit a greater propensity to seek education, acquire knowledge and access job opportunities. Good health and fitness of the people will truly be a reflection of our country’s progress. 10.Health is an important characteristic of human well-being. In a country like India where lifestyle-related diseases have shown a rising trend, precautionary strategies have become important. Our healthcare sector has to be equipped to not only treat people but also guide them about prevention of medical conditions. It calls for developing expertise to undertake counseling to foster healthy living. 11.Medical profession and piety have a deep connection. This occupation is a noble mixture of knowledge and compassion.It empowers you to lend a helping hand to the society at large; to touch and transform the lives of people. Remember that patients do not visit hospitals on their own volition. They do so when circumstances require them to. They go with an unwavering belief in being remedied by the marvel of medical science. 12.Curing the sick and healing the bedridden are considered God’s own work carried out through your hands. The society admires you for your selfless endeavours; it holds you in high esteem; and views you with lofty expectations. The faith people repose in you is sacrosanct and has to be respected at all times. You have to be ever-willing to adhere to the needs – of hard work and sacrifice – of your profession.I hope that you all will remain steadfast in your conviction to the higher objective of selfless service to society. May you achieve greater success in life and career! Let me conclude in the words of Mahatma Gandhi: "Happiness depends on what you can give; not what you can get”.